Fashion Show Week in New York is not where one expects an auto manufacturer to confirm that they are going to build a concept vehicle shown two years ago in Detroit. 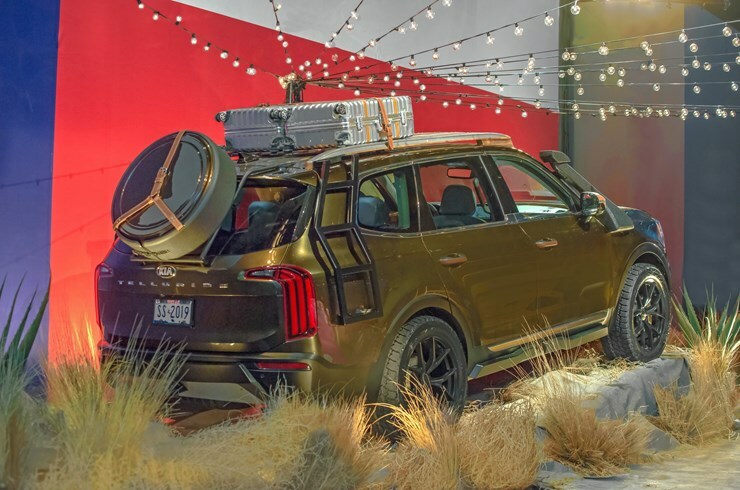 Kia did exactly that – and took it a step further by showing a Texas inspired ‘bespoke’ edition of the new 2020 Telluride full-size luxury SUV to boot. 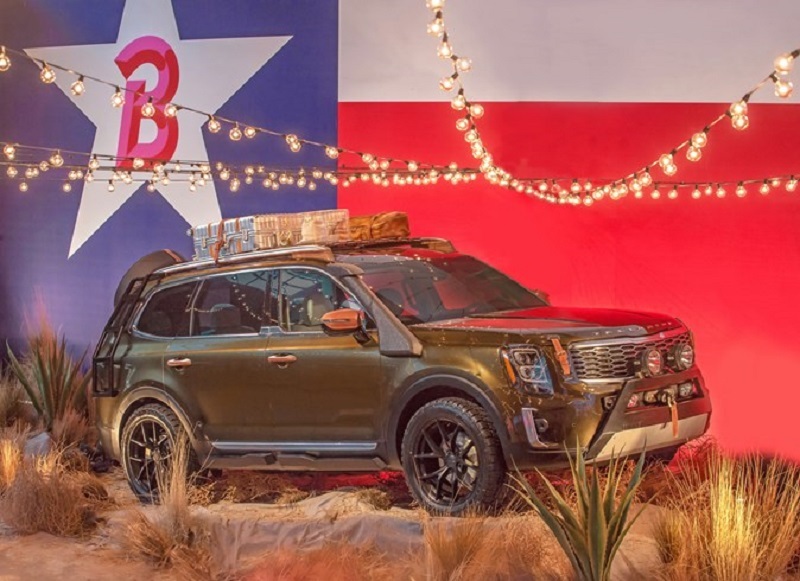 Partnering with the unveiling of the Brandon Maxwell Spring/Summer 2019 Collection: ‘Texas’, Kia created a one-of-a-kind Telluride that reflects the Southwest inspirations seen in Maxwell’s Spring/Summer Collection. Kia and Brandon Maxwell are advocates for giving back to communities in need. Their partnership will help meet the needs of the public-school system in rural Marfa, Texas by providing technology purchases and educational programming for the district. In addition – to providing a vehicle for local teacher use. Brandon Maxwell is a native Texan born and raised in Longview, Texas. He earned a degree in Photo Communications at St. Edwards University in Austin before moving on to New York where – as they say – the rest is history. This unique relationship with Marfa, Texas is a result of time spent designing his Spring 2019 collection during a several months stay in the well-known desert city in West Texas. Drawing inspiration for the collection from the people and locale, he decided to partner with a number of sponsors including Kia and give back to the Marfa community. The bespoke (one of a kind) Telluride revealed at the 2018 New York Fashion Week show highlight memories of Maxwell’s Texas roots. Included are natural wood interior trim and saddle-inspired double-stitched leather adornments on the dash, door panels and grab handles. Similar leather details cover the outside rearview mirrors and door handles. On the outside, the deep green paint reflects the Telluride concept vehicle that debuted in Detroit two years ago. Ready and able to travel the rough and tumble trails of Texas, it features custom front and rear bumpers plus skid plates and sidestep sills for a ranch-ready look that also includes a hidden winch and a snorkel for deep-river fording. The Maxwell Telluride runs on 265/50R-20 off-road tires mounted to flat-black alloy wheels. The spare tire is custom mounted to the rear hatch, that opens to a metal- and leather-trimmed cargo area. A custom wood and aluminum roof rack with a beautiful custom leather tow strap tongue provide the finishing Texas-inspired touches. 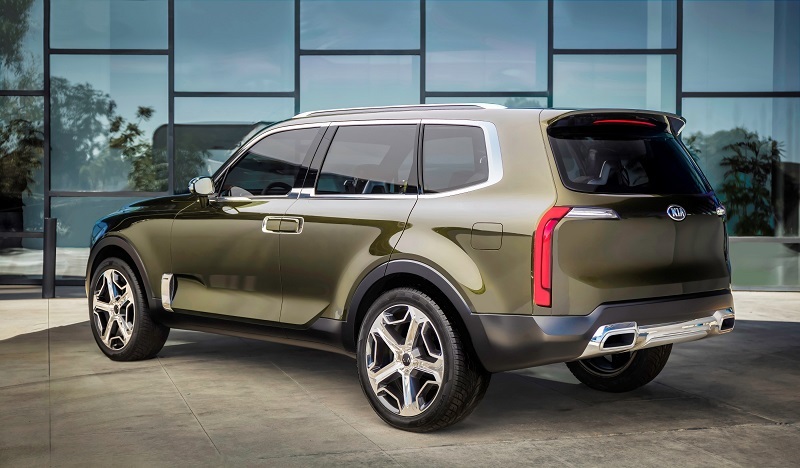 The Telluride ‘Concept’ as shown at the 2016 NAIAS (Detroit Auto Show) featured a number of elements that may (or may not) appear in a final 2020 production version. 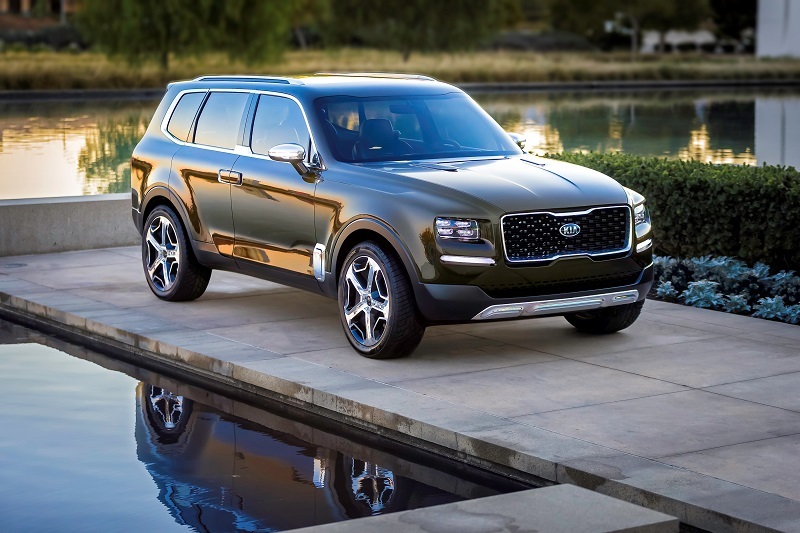 Kia showed a three-row, seven-passenger, full-size luxury SUV concept with an upright shape and muscular stance and included a whole lot of state-of-the-art technology. 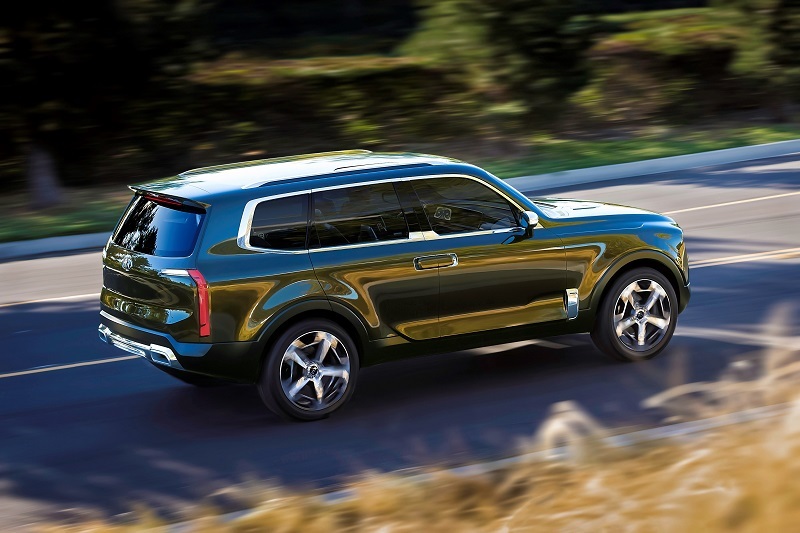 Underpinning the Telluride Concept was a modified Sorento chassis with a wheelbase stretched 11.9 inches to 121.3 inches. 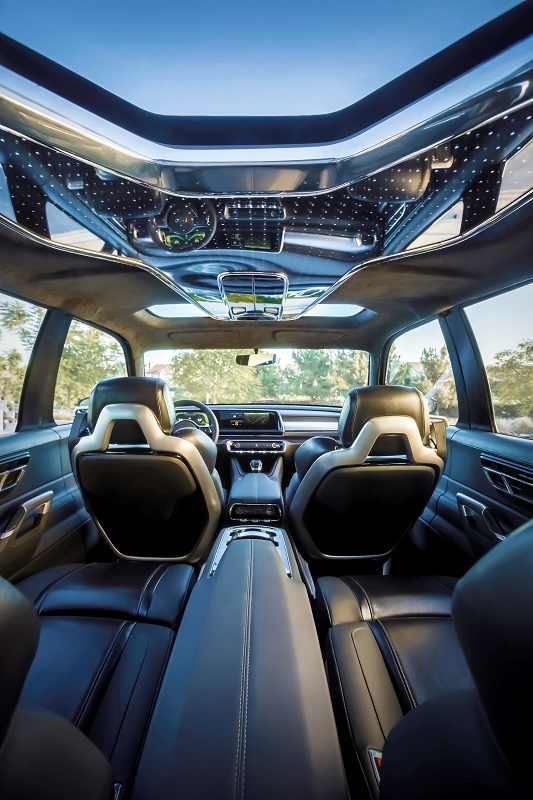 Telluride was 4.4-inches taller, 4.7-inches wider, and 9.5-inches longer than the current Sorento – giving it a palpable dominating presence. Adding to its muscular presence were flared fenders and 22-inch five-spoke wheels wrapped in Hankook Ventus ST 275/45R22 tires. The front fascia incorporated a larger version of Kia’s signature tiger nose grille accented by recessed quad-LED headlamps, pronounced horizontal LED indicator lights, and a polished-metal skid plate below the bumper. In the rear, thin vertical taillights aligned with the modern design language of the SUV with consistency of styling cues across the front and rear door handles, hood scoops and dual exhaust tips. Telluride’s interior and exterior were finished in Dark Pyrite green paint. The front doors and rear-hinged back doors swung open 90 degrees in opposing directions, providing an expansive portal into the panoramic interior space. Four black-leather captain’s seats seemed to float within the spacious cabin in front of a folded third-row bench. The middle seats were able to recline nearly flat and include large fold-away footrests. 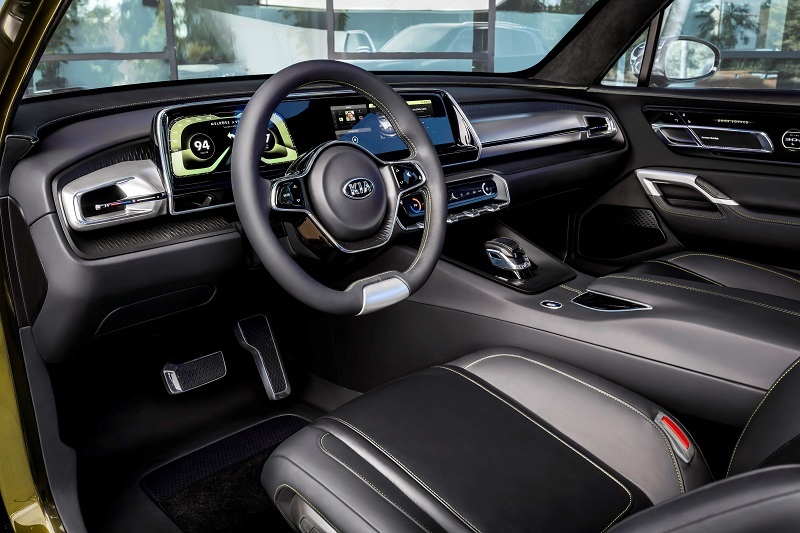 Throughout the cabin was Kia’s first use of 3D-printed components that added a distinct, modern design element to the dashboard, door panels, and steering wheel. The technology shown on the concept was very interesting – to say the least. All four seats included a series of precise diamond-cut openings in the seatback, each embedded with Smart Sensors to capture a passenger’s vital health information. The vitals would be displayed on the interior door panel screens, which then would synchronize with a Light Emitted Rejuvenation (LER) system. The LER system utilizes a wing-shaped LED panel mounted beneath the oversized sunroof that displays a pattern of therapeutic light designed to treat desynchronosis (jetlag) and improve the passengers’ energy levels. 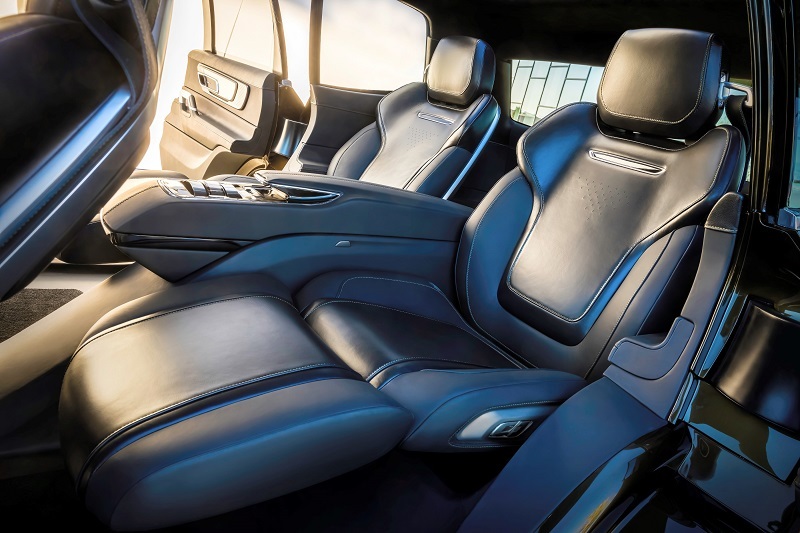 Another unique technology introduced in the Telluride Concept was Swipe Command – a thin, touch-sensitive, interactive band mounted to the second-row center console – which allows rear-seat passengers to quickly scroll and select desired media by simply swiping their hand. The selected media is then played either through the seven-speaker premium Harman Kardon audio system, or via a set of portable Harman Kardon headphones that wirelessly charge when stowed in the console. Up front, a compartment in the center stack allows for wireless cell phone charging. Under the hood was a plug-in hybrid electric power plant (PHEV) anchored with a gasoline direct injection 3.5L engine combined with an electric motor, together, producing 400 horsepower with fuel economy said to be over 30 mpg. Sporting an advanced all-wheel drive system – it also featured a finger-print activated push button start. 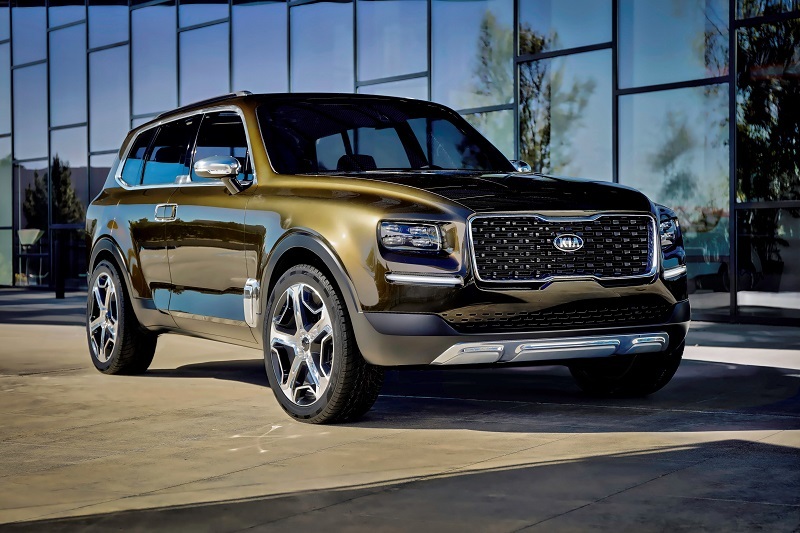 The production 2020 Telluride will be built at Kia Motors Manufacturing – Georgia. Final production vehicle specifications and feature/function details are not yet available. What we do know is that, if it reflects inspiration from the Brandon Maxwell edition, we will be well pleased.